Goedknegt, M. A., Havermans, J., Waser, A. M., Luttikhuizen, P. C., Velilla, E., Camphuysen, K. (C. J. ), van der Meer, J., Thieltges, D. W.
An introduced species’ invasion success may be facilitated by the release of natural enemies, like parasites, which may provide an invader with a competitive advantage over native species (enemy release hypothesis). Lower parasite infection levels in introduced versus native populations have been well documented. However, any potential competitive advantage will depend on whether native competitors exhibit higher parasite loads than introduced hosts and whether native hosts suffer more (e.g., reduced reproduction or growth) from parasite infections than introduced hosts. In this study, we compared macroparasite richness, prevalence, and intensity in sympatric populations of one native and two introduced brachyuran crab hosts in the centre of their European range. While the native green crab Carcinus maenas (Linnaeus, 1758) hosted three parasite groups (acanthocephalans, microphallid trematodes, rhizocephalans), the two invasive crab species Hemigrapsus sanguineus (De Haan, 1835) and H. takanoi Asakura and Watanabe, 2005 were only infected with acanthocephalans. All acanthocephalans were molecularly identified (COI) as the native Profilicollis botulus (Van Cleave, 1916). 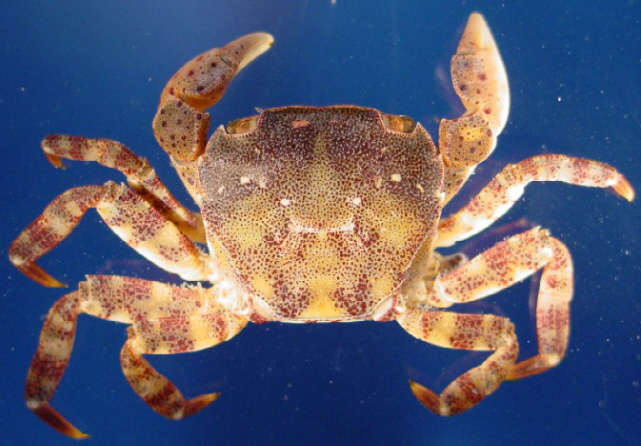 Prevalence and intensities of P. botulus were generally lower in the introduced than in the native crabs. Metacercariae of microphallid trematodes were only found in the native C. maenas, with mean infection levels of 100–300 metacercariae per host, depending on geographical location. Likewise, the castrating rhizocephalan barnacle Sacculina carcini Thompson, 1836 was only found in C. maenas at a few locations with low prevalences (< 3%). This first study on infection levels in invasive Hemigrapsus species in Europe indicates that these invasive crabs indeed experience lower infection levels than their native competitor C. maenas. 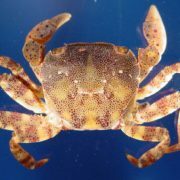 Future experiments are needed to investigate whether this difference in infection levels leads to a competitive advantage for the invasive crab species.